Saving the world, one recess at a time. The American Heart Association and Center for Disease Control both recommend 60 minutes of moderate to vigorous physical activity in youth. Only about ¼ of America’s youth meet this recommendation. Don't be a statistic - come play with us! Make your passion for faith, family, and fitness your paycheck with the only Christian business opportunity focused on kids fitness! Make money AND a difference using RR's Rejoice at Recess program to build Godly character, Godly confidence, and Godly friendships in the youth of your community. Looking for a healthy activity for kids and family? 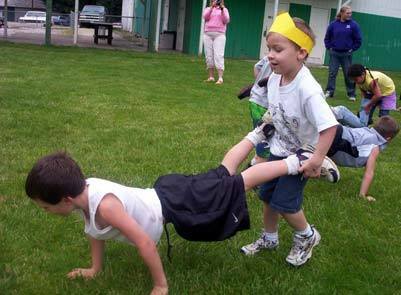 Try one of our favorites – the wheelbarrow race! Easily played indoors or out, this is entertaining (exercise) game is great for core and overall body strength, as well as endurance! But kids would never know; the giggle and squeals that flow freely make it seem to be all just fun and games… ENJOY! Exciting updates, enertaining exercise tips, healthy + kid-friendly snack ideas, and more straight to your inbox. Sign up today!